Train operator TransPennine Express (TPE) is teaming up with the people behind North Yorkshire’s Moorsbus network to co-promote rail and bus connections straight to the heart of some of England’s finest countryside. The new partnership will see both organisations encouraging those looking for a car-free, carefree Sunday or Bank Holiday Monday in the North York Moors National Park to make the most of connections between train and bus services at Thirsk station. TPE provides direct train services to Thirsk from a range of destinations across the North and when customers arrive, Moorsbus services will be waiting at the station to take them on a journey of discovery across the North York Moors, providing all day bus travel for a low fare. Easy interchange between train and Moorsbus is available at Thirsk, where easy access Moorsbus service M11 available to take visitors through the scenic Howardian Hills to Byland Abbey and Helmsley. At Helmsley, a frequent shuttle service takes visitors to beautiful Rievaulx Abbey, with a choice of other destinations available including Sutton Bank, described by famous vet and author James Herriot as “the finest in England”. It’s hoped more awareness of the easy connections between train and Moorsbus services will encourage more walkers to enjoy what Moorsbus organisers call a “buswalk” – a linear walk through stunning countryside, returning to the start point by bus. Charlie French, Transport Integration Manager for TPE, said: “We are privileged to have some of the most beautiful countryside in the UK on our network and the new partnership will create a seamless, integrated connection for visitors, allowing them to leave their car at home. TPE is also working on further improving connections at other stations in the region. Three years ago, a group of volunteers saved the Moorsbus service from withdrawal, with the aim of creating an affordable transport system around the North York Moors and surrounding areas to allow people to travel without a car. Thanks to support from regular passengers, charity grants including support from the North Yorkshire Moors Association, and fundraising, the Moorsbus network has steadily grown to reach more communities, benefiting local people as well as those visiting the area. 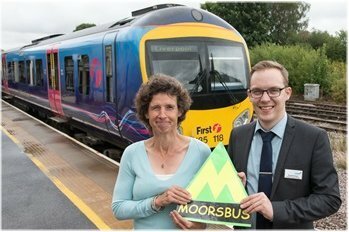 Bill Breakell, of the Moorsbus Community Interest Company, said: “This new partnership with TransPennine Express is great news for everyone who loves the North York Moors. It’s about encouraging people to leave the city behind for a day and enjoy some of England’s finest countryside and visitor attractions – while leaving the driving to us. with Helen Gundry, Moorsbus Director. Full information and money-saving Advance tickets for TPE services are available online at: tpexpress.co.uk or from staffed stations and rail travel agents. Timetables, fares and routes for all Moorsbus services, including those connecting with TPE trains at Thirsk station, are available online at: www.moorsbus.org, while printed Moorsbus guides are also available from libraries, tourist information centres and transport information offices in areas served by Moorsbus.